The University of Adelaide has demonstrated its research credentials with six academics listed among the world's most highly cited researchers. The Thomson Reuters ranking covers an 11-year period from 2002-2012, listing researchers who have made an "exceptional impact" in their specialty field. Titled The World's Most Influential Scientific Minds, the report was compiled by identifying a small set of researchers - only 3215 worldwide - who wrote the greatest number of highly cited papers in their field. Professor Mike Brooks, Deputy Vice-Chancellor (Research), says having so many researchers in this elite group is a fantastic result for the University. "There were 78 high-citation researchers Australia-wide, so having six associated with the University of Adelaide - and the only ones in South Australia - is quite an achievement," he says. "It's the pinnacle of academic success to publish papers that are highly cited, being extensively referenced by other scientists - it means you're making an outstanding contribution which is influencing world research." Attracting highly cited researchers to Adelaide is a key aim of the University's Beacon of Enlightenment strategic plan. "We aim to attract many more research stars in the coming years and be at the very top level of citation performance. I think we've already demonstrated we're capable of achieving that goal," says Professor Brooks. Finding ways to introduce new behaviours and routines in large and often entrenched health systems has been the underpinning theme of Alison Kitson's research for more than 20 years. She has been focusing on an approach called "knowledge translation" to achieve her lifelong goal of improving patient care. Professor Kitson's insights have been highly influential worldwide in helping health authorities understand how they can better embrace new initiatives and practices. Research has been a major focus throughout her career, including senior positions at Green Templeton College at the University of Oxford and the Royal College of Nursing in the UK. 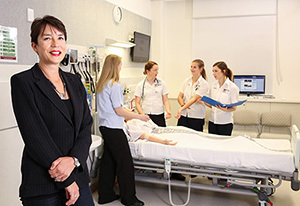 She has brought that passion to the University of Adelaide's School of Nursing in her position as Dean, and its international reputation has grown accordingly. A key aim since joining the school in 2009 has been to establish a global research network focused around the importance of patient-centred care. Epidemiologist and public health expert John Lynch believes researchers should focus on three key areas to succeed in having their work regularly cited. They need a strong sense of society's big questions, good data to address those questions and, finally, they must be able to communicate. According to Professor Lynch, many scientists succeed with the ideas and data only to let themselves down by failing to fully explain their work, even to their scientific colleagues. "Even among the best scientists, some people are shocking writers," he says. "I've always worked very hard on my own pieces to tell a story that will engage the scientific community. "Good writing is an undervalued skill across science, to be honest, and I cannot emphasise that enough - it's important to communicate clearly." During a distinguished research career, the Professor of Public Health at the University of Adelaide has been cited more than 11,000 times. He is an internationally recognised scholar who spent 20 years in North America and also worked in Europe before returning to Australia six years ago. In 2007 his work in public health was recognised with an honorary Doctorate in Medical Science from the University of Copenhagen, and in 2009 he was awarded a prestigious National Health and Medical Research Council Fellowship. The main focus of Professor Lynch's work over the past four years has been an early childhood project to make better use of the masses of government data on child health and development. The whole-of-population study captures more than 240,000 children up to the age of 13 who have been born in South Australia since 1999. Peng Shi is a distinguished international researcher who believes in following his dreams. It's a journey which has taken him around the world before joining the University of Adelaide's School of Electrical and Electronic Engineering two years ago to continue his breakthrough research in intelligent systems and automation and control. Professor Shi graduated from one of China's leading technology and engineering universities, Harbin, in 1982 and over the years has progressively added to his impressive academic record at universities in the UK and Australia. He also spent six years applying his skills at Australia's principal defence research establishment, the Defence Science and Technology Organisation, from 1999. 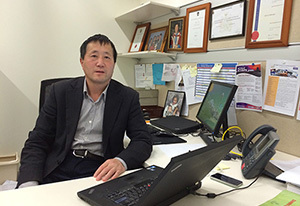 Professor Shi says he was attracted to the University of Adelaide because of its reputation as one of Australia's top Group of Eight research universities. "It's allowed me to keep following my dreams and continue research into areas that have real-world practical applications, whether it is in defence, industry or manufacturing," he says. He is delighted on two levels at being nominated as one of the world's most highly cited researchers. "It's really pleasing to have your work recognised by your peers and colleagues, and to know that you are playing a leading role in an area in which you are so passionate about," he says. "But I'm also very happy to have my work making some kind of contribution to the university's reputation - because it really is a team effort." 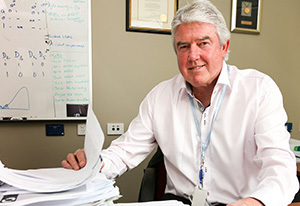 Timothy Hughes credits good fortune and great teamwork for being ranked among the world's most highly cited researchers. It's a typically modest response from someone whose work has helped revolutionise the treatment of chronic myeloid leukaemia (CML). The Head of Translational Leukaemia Research at South Australian Health and Medical Research Institute (SAHMRI) and the University of Adelaide has led a team which has been at the forefront of research into leukaemia using drugs called kinase inhibitors. The approach has saved countless lives. Before 2002 only 50% of patients survived beyond five years, now 90% can expect to live at least that long. "We've been very fortunate to be at the centre of this paradigm shift in the way we treat leukaemia, with a move away from harsh and untargeted chemotherapy to this very targeted small molecule approach," says Professor Hughes. "And it's been a real team effort. Adelaide wouldn't be regarded as a global centre of excellence in this disease if it weren't for the groundbreaking work of our scientific team lead by Associate Professor Susan Branford and Professor Deborah White. "Their work in developing monitoring strategies and predictive bioassays are of global significance and has enabled Adelaide to be a key player in all of the critical international CML trials." 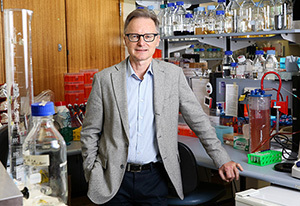 Professor Hughes, who is also Head of the Department of Haematology at SA Pathology, Royal Adelaide Hospital, was recruited to Adelaide in 1993 to head up the University's leukaemia research group after spending five years in London and Los Angeles.